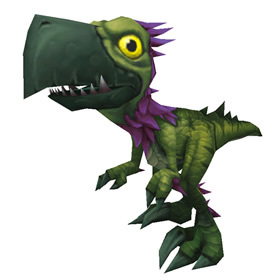 The Sharptalon Hatchling can only be obtained when the Broken Isles World Quest "Sharptalon Swarm!" is active on the coast in Val'sharah. If the World Quest for this specific falcosaur species is not active or is about to time-out, the NPCs necessary will not be visible. The Matriarch of the species will spawn during the active World Quest. Defeating her will allow you to see an Orphaned Sharptalon in the questing area. Interacting with this NPC will not yield any results unless you have the hatchling's favorite type of food. The pet's journal description hints at what type of consumable it prefers. This particular falcosaur enjoys Dried Bilberries. So I was questing on a new character in Azsuna, and while doing the chain in the academy I happened to think to myself, "huh... I don't have a pet out... Shamrock, you're up!" My green little hatchling came up, and it took me a minute to notice that it had a spell book in one of it's claws, and it was periodically turning transparent and back again. It still ran around and said random things like information on this pet says, but somehow it has a book! I wonder what it grabs in other places? I had trouble finding this guy the first few times around. Once you kill the Matriarch, head up the path with the headless skeleton. (make sure you loot the matriarch first) Ride right over the top of skeleton and then up a small rise, almost directly south-east of Matriarch nest. Make sure you have your Dried Billberry with you. Talk to the Orphan and then it will appear in your pet inventory. So tried two more times during quest times to get it, but from then, he didnt spšawn for me once, and I killed the Matriarch more than 10 times all together. Any ideas what to do? I reported bug, seem unable to get to live help. This little guy destroys water fabled beasts in Pandaria. Most of the time you only need him. Use the 1-1-1 set. Start with Falcosaur Swarm. Then use Predatory Strike. Finish with Wild Winds. Found at 47.07, 10.53, just up the slope from where you kill the matriarch. You have to wait 24 hours between quests to recieve the next one. If you look at the emotes they do after you lvl them up they say something along the lines of 'hatchling needs time to rest after his adventure.' Try summoning him again the next day and he should have a new quest for you. I know exist a very long chain and the quests givers are the new falcosaurs. In theory the chain should give a mount for each one of them, if i understood well MMO, but when i get my first falcosaur this morning he asked to me only to level up him to lv 25, then i didnt get any other quest from him. Maybe we will need all 4 of them at max lv to start the chain? Any idea? Sharptalon falcosaurs can subsist entirely on a diet of small nuts and berries, and use their talons mostly for defense.